Outdoor Gym QR CODE - How to use a 4 person combo? Outdoor Gym QR CODE – How to use a 4 person combo? Home » Outdoor Gym QR CODE – How to use a 4 person combo? Sit Up Board: Lie flat on the board, with feet toward the unit. Put feet under the farthest bar (tops of feet pressing against bottom of bar). Placement of knees will be between the board and the closer bar. Lying back flat on the board, lift arms up so user’s hands are near the head. Pull body upward and toward feet. Lie back and repeat as desired. Chin Up Bar: Reach arms up and hold the bar with both hands (either facing both palms out as you grasp the bar, or facing them both inwards). Bending the arms, pull body upwards repeatedly. 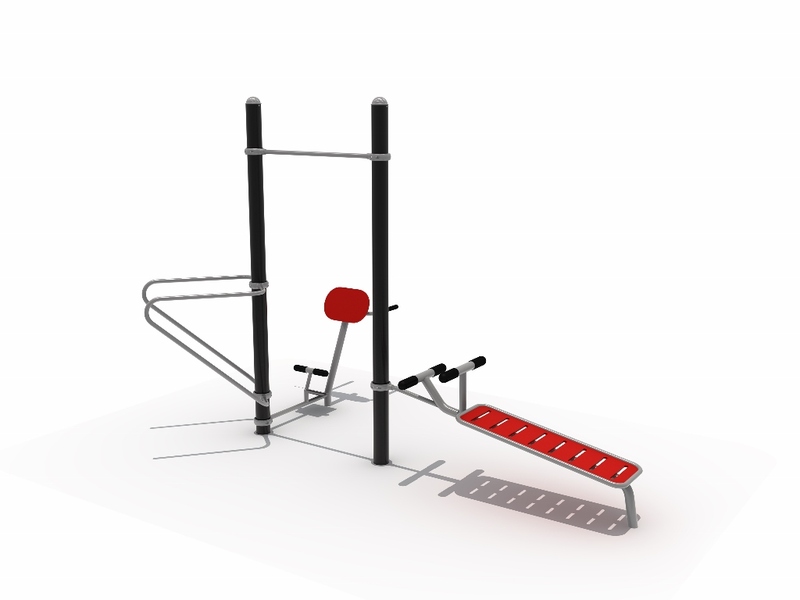 Dip Bars: Facing the unit, place your body between the bars. Bending arms up and back, grasp the left rail with the left hand, and the right rail with the right hand. Lean forward slightly and push up with arms, bending knees to lift calves and feet backward off ground. Repeatedly lower and raise body by bending arms. Hyper-extension: Lie face down on a hyper-extension bench, tucking your ankles securely under the foot pads, place thighs across the plastic pad. With your body straight, cross your arms in front of you or behind your head, start bending forward slowly at the waist as far as you can while keeping your back flat. Keep moving forward until you feel a nice stretch on the hamstrings and you can no longer keep going without a rounding of the back. Slowly raise your torso back to the initial position as you inhale. Provides a combination of functions: high-intensity core and arm workout, building the main chest, shoulder, abdomen, and arm muscles. This unit is designed for 4 users at a time. It is unsafe to stand near the equipment when it is in use by another user.